These sturdy DIN rail mounting brackets come in handy for a wide variety of projects where DIN rail is used for mounting devices. The flat mounting surface and the three mounting holes make this clip versatile for mounting devices that do not have their own DIN rail mounting clip. This clip is designed in such a way that allows it to be clipped onto standard 35mm DIN rail as well as 32mm rail. 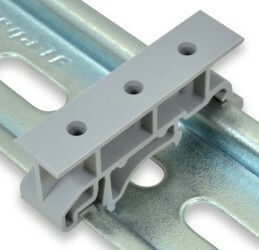 For 35mm DIN rail, these clips work with rail depths of 7.5mm or greater. We also offer thinner clips as part numbers DINM12-RC, DINM13-RC, and DINM15V2-RC. The mounting holes of the DINM01 clips are non-threaded. Coarse thread #6 or M3 screws should be used. When mounting a standard 0.062" PCB, #6 x 3/8" Sheet Metal screws are a good choice. These are available in bags of 100 (Winford p/n SCSMPP-6-0.375-100).